When Star Wars: The Last Jedi opened last December, it became one of the rare movies that was acclaimed by the majority of critics, while leaving a good portion of fans disappointed. Now the debate can rage on, as the film is being released on Blu-ray. As someone who considers himself both a critic and a fan, I was somewhere in the middle. This is an entertaining entry into the saga that has elements to like about it, but it also has a lot of plot holes and makes some problematic choices. I personally found it to be good but not great, and for more on the film itself, you can read our three views of it right here. The Blu-ray includes a commentary track with director Rian Johnson, as well as an entire second disc devoted to bonus features. The main attraction here is obviously The Director and the Jedi, a surprisingly hearty 95 minute documentary on the making of the film. It offers an in depth look at the entire production, from scriptwriting to location scouting, set building, and the actual shoot, which lasted over a hundred days. As a Blu-ray bonus feature, The Director and the Jedi is pretty darn impressive. It’s an engaging and well made look at what it takes to pull off a film with this many moving pieces, while also being an entertaining film in its own right, and shedding more light on some of the story choices that Rian Johnson made. The most revealing moments are when Mark Hamill is talking about how he initially wasn’t happy with the character choices that were made regarding Luke Skywalker, but reconciled himself to these creative differences in order to do the film and reprise his role. The disc also includes the featurette Balance of the Force, which features Rian Johnson talking about his ideas for the Force and how it is used in the film; the scene breakdowns Lighting the Spark: Crafting the Space Battle, Snoke and Mirrors and Showdown on Crait, which provide deep dives into the visual effects behind three key sequences; Andy Serkis Live! (One Night Only) which presents the raw footage of Snoke’s big scene before the actor was digitally painted over. Finally, there are about twenty minutes of deleted scenes, which are preceded by an introduction from Rian Johnson and feature an optional commentary track with him as well. There are some fine moments here, but these cut scenes ultimately would have made a long film even longer. Because the bulk of these bonus features were obviously shot during the production, it’s also bittersweet to see Carrie Fisher featured throughout, and they directly pay homage to her in The Director and the Jedi, acknowledging how hard the entire cast and crew was hit by her passing. Regardless of your thoughts on The Last Jedi itself – I still have some mixed feelings about the film and some of the choices that it makes – the wealth of bonus features here, starting with the very good The Director and the Jedi, makes this a highly recommended Blu-ray release. 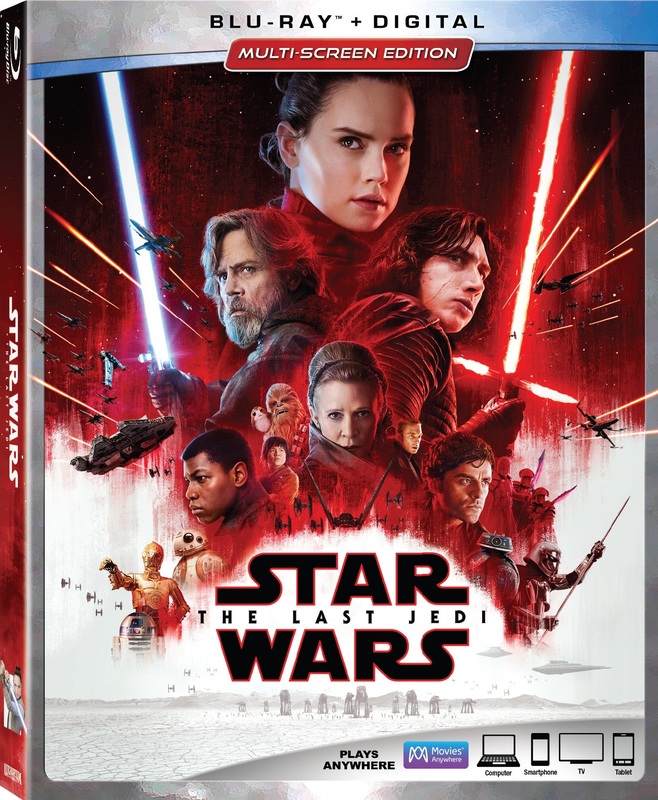 Star Wars: The Last Jedi is a Walt Disney Studios Home Entertainment release. It’s 152 minutes and rated PG.